The course was masterfully designed by Peter Thompson, Michael Wolveridge & Perrett with a design philosophy deeply respecting the natural on-site contours of the land. The 18-holes championship course offers a unique, challenging and world-class experience for golfer of all levels. The golf course site has a serene atmosphere. The fairway landform is gently undulating, mild breezes come off the sea and dappled shade from the palm leaf canopy overhead completes the pleasant environment. Greens are generous in size and smoothly undulating. Around the course there are numerous bunkers of various depth, size and shape, strategically places to test all golfers. Guests may choose to enjoy the hole number 1 – 9 that facing to the sea, hole number 4 that is adjacent to the white sandy beach, hole number 10 – 18 with the captivating mountain views, or the famous hole number 12 people often talk about, with 540 m, Par 5, Handicap one. Golf Rinjani Country Club is situated 500 meters above sea level. It has an 18 holes standard course with a club house, personal villas, swimming pool, pro shop and coffee shop. It is located 35 kms from Senggigi Beach, Lombok Indonesia. The course was architected by Jack Nicklaus, 18 Holes, Par 72. 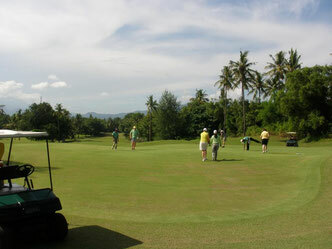 With its two very different nine-hole layouts, the golf course is designed to ensure playability for all level of golfers...Read more..
Day 1: Arrival at Lombok Airport proceed for lunch followed by city sightseeing tour. Check in at hotel for 2 nights stay, vehicle standby till dinner time.